things that I can put on her lap, we always have things that we can go back for! Part way through our shopping trip my mom spelled out Crescent Rolls. I had no idea what that meant, but I told her that we would see if they had anything. At that point I assumed that she had seen a recipe on tv or something. She also said that it was for Jenna. Costco didn’t have any Crescent Rolls…so my mom insisted that we went to Rainbow after. After picking up the rolls..I decided to figure out what on Earth we were going to do with these things. She spelled out Apple Hotdogs. This baffled me. She wanted to make apple hotdogs? After a bit of thinking…I realized on the way home that she meant apple sausage. I finally figured out that she wanted to make pigs in a blanket with our apple sausage for my sister’s dinner. Wow! That became what my afternoon was about. After solving the puzzle I laughed & told her ok. 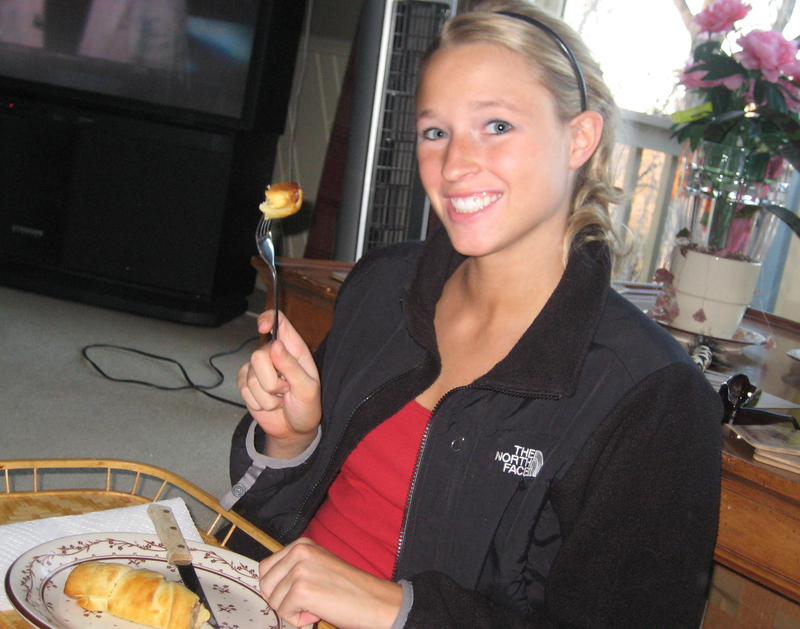 I just hoped that Jenna would be willing to eat it when she stopped over after work. She was heading to Swarm practice tonight & came to our place in between. This may be a boring story, but it shows how communication can be difficult for us. 90% of the time I can guess what my mom is thinking with only 2 words or so. It becomes difficult when I can’t guess…and she gets frustrated with me. Jenna is an extremely picky eater & we are always thinking of new ideas for her. See, still taking care of my baby sis! Luckily she seemed to enjoy her dinner. SUCCESS!! 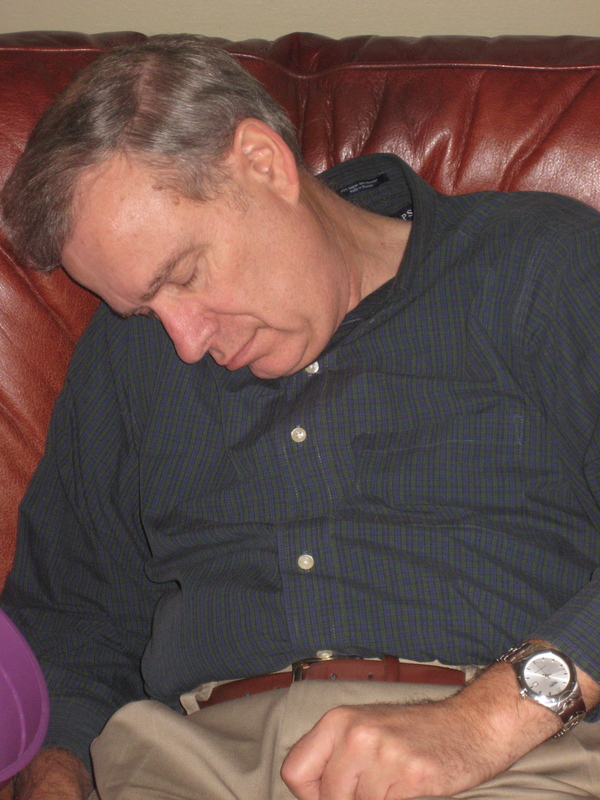 When my dad walked in the door after my mom and I arrived home…he announced that he was really tired & sat down on the couch. After 2 minutes he was out. Instead of waking him, we partied around him. If you wake him, he will get up and continue working. In a way, we were forcing him to take a nap. Jenna ate her dinner on the floor at his feet. haha. Then she showed us some of her dances all while my dad was out like a light. What a strange family….huh? A fun one though! I just got back from the tanning salon. I decided to get a little Vitamin D since I haven’t really been in the sun lately. I am doing it more for therapeutic reasons than to get a tan. I know tanning is naughty! I only went 7 minutes….I promise! Now I am watching the Women of SNL. So funny! I am taping it for my mom…because I know it will make her laugh, and there is nothing better than that! Prayer for Julie: Pray for her disease to continue staying the same. She has been about the same for a very long time now! And staying healthy! YES!